POSTED Wed, 06/14/2017 - 16:00 | POSTED BY Traci C.
Walt Disney Parks and Resorts announced a new pavilion for this year's D23 Expo: 'A Galaxy of Stories.' This pavilion will give guests the chance to get an exclusive look at the new Star Wars-themed lands at Disney's Hollywood Studios and Disneyland. POSTED Sat, 04/09/2016 - 16:00 | POSTED BY Traci C.
Earlier this week we told you about the D23 Expo 2017, and now we have news about another D23 event but this one takes place at the Walt Disney World Resort! D23 Destination D: Amazing Adventures is scheduled for November 19-20 at Disney's Contemporary Resort. POSTED Fri, 04/08/2016 - 16:00 | POSTED BY Traci C.
D23: The Official Disney Fan Club has announced the dates for the next D23 Expo. The 2017 Expo will take place July 14-16, 2017 at the Anaheim Convention Center. Tickets for the event go on sale later this summer. POSTED Wed, 02/24/2016 - 17:00 | POSTED BY Traci C.
D23: The Official Disney Fan Club is hosting several special events for Gold Members during the next the next few weeks. Two of the events are taking place at the Walt Disney World Resort and two are planned for next week in Chicago. Read on to find out more details. POSTED Tue, 03/31/2015 - 16:00 | POSTED BY Traci C.
D23 recently announced a slate of special events for members at the Walt Disney World Resort including two events celebrating classic Disney films. The film events will be held for the first time in Central Florida and will include guest speakers and other surprise, just like the events held at The Walt Disney Studios lot. 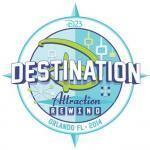 POSTED Tue, 06/10/2014 - 05:00 | POSTED BY Traci C.
More names have been added to the roster of talent for D23 Destination D: Attraction Rewind. The event is presented by H2O Plus and is scheduled to take place November 22 and 23 at the Walt Disney World Resort. The roster of special guests includes Disney Legends, Imagineers, and others who are coming together to celebrate fan favorites including Adventure Thru Inner Space, If You Had Wings, and 20,000 Leagues Under the Sea. The D23 Disney Fanniversary Celebration is hitting the road this summer, taking the celebration of Disney milestones and anniversaries to select cities around the country. The celebration is presented by Walt Disney Records The Legacy Collection and this year's Fanniversary will showcase theme park attractions, films, television series, the 1964-65 New York World's Fair, Sleeping Beauty, Haunted Mansion, Disney's Hollywood Studios, and more. POSTED Tue, 04/08/2014 - 05:00 | POSTED BY Traci C.
If you're a fan of extinct Disney World attractions, the D23 Destination D: Attraction Rewind event is one you don't want to miss. D23: The Official Disney Fan Club is hosting the event that will honor Disney attractions of years gone by including 'If You Had Wings' and '20,000 Leagues Under the Sea' through stories, vintage videos, and concept art. The two-day event takes place November 22 and 23 at the Walt Disney World Resort.